Kosem runs on Star TV in Turkey and is produced by TIMS productions, and produced by Timur Savci. For more info: Kosem Wikipedia entry, Muhtesem Yuzyil Kosem on Facebook, Star TV, TIMS productions. This episode begins in Safiye’s audience chamber, where she is meeting with a man named Yakub, who has come to report on problems with her charity’s fund. He has been questioned about the money in their accounts by Dervish, and he’s alarmed. He claims he told him nothing, but he’s afraid Dervish will return to question him again. In a rather brutal scene, Safiye has him poisoned via the cup of coffee he is served. She withholds the antidote while he cries for mercy from the floor where he is lying, gasping for breath. Only when he promises to be loyal to her and say nothing if he is questioned again is he given the antidote by Nasuh aga. Outside the chamber, Yakub is leaving when he encounters Dervish. He scuttles away and Dervish and Nasuh aga meet. They clearly can’t stand one another. Nasuh aga insists on being called pasha now because he had been appointed beylerbey of Aleppo. He also says sourly that Dervish’s schemes have actually benefitted him since he is now in line for advancement in the Divan. Ahmet orders Nasia to return to the harem when Iskender is brought over to him, blindfolded. The blindfold covers most of his face, so when she walks past him, Nasia doesn’t recognize her old friend Alex. 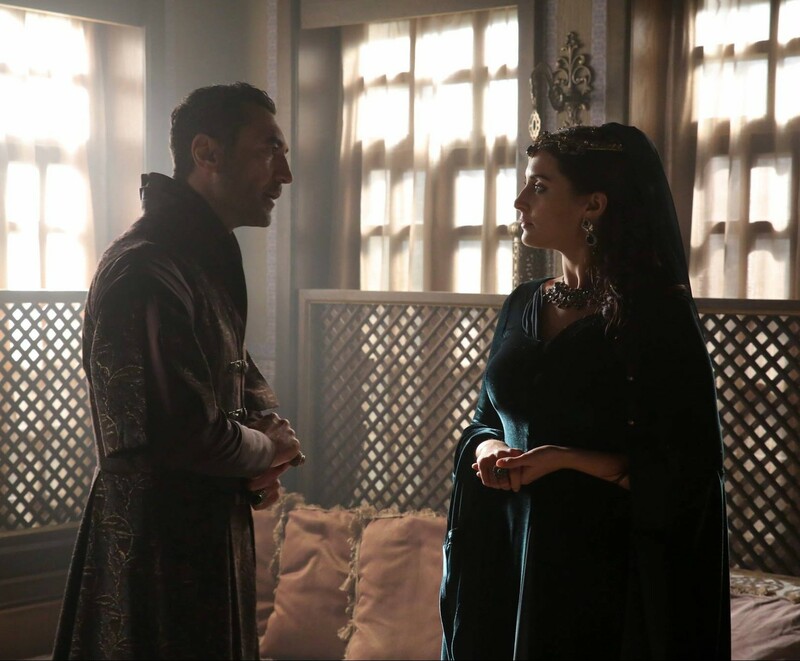 But when she hears him speak in reply to the sultan, she hesitates for a moment, as if the voice sounds familiar. Ahmet removes his blindfold and Iskender sees who he is facing. He bows his head. Iskender has no defense for this. Ahmet calls for his weapon. He holds the sword to Iskender’s throat and circles him, making him wait. Ahmet is clearly beginning to feel his own power. Dervish has been shown into Safiye’s chamber, standing in the same place where the unfortunate Yakub was. Safiye give him a short lecture. She knows of course that he was instrumental in her own defeat, getting rid of her servants and cutting off most of her funds. She asks him what he thinks will be written by the chroniclers about him. Dervish tells her he will be known for his loyalty to the sultan. Safiye tells him sarcastically that she’s heard this before. She serves him a cup of his favorite fruit sherbet. He is obviously aware of her poisoning tactics, but he drinks it anyway. Saifye: “This is the important matter. I am sure that a loyal, smart, educated man like you has many suitors, but….” In fact, she surprises him by offering to marry him to her own daughter Fahriye Sultan. Nasia is walking down the hallways of the harem, looking happy for a change. She finds jasmine in her hair, and is remembering her time with Ahmet, and is probably dreaming of their kiss. Nasia looks embarrassed and denies the implication, but Cennet insists on this. The other girls in the harem notice and draw the same conclusion. Ahmet insists that he’s fine. He wants his mother to stop fussing over him. 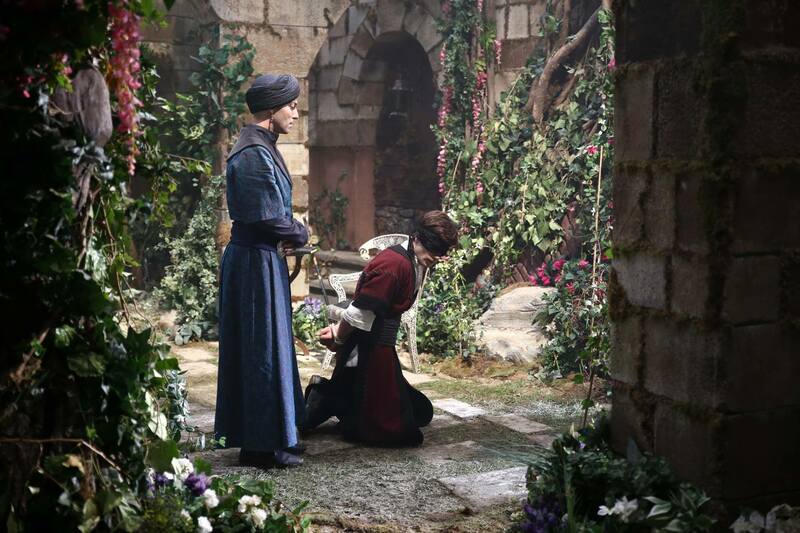 Handan tells her son that Dervish has been summoned by Safiye Sultan. She’s concerned about what might happen to him. Shahin is shooting a crossbow and Mehmet is on his way out. But the gates are closed and the servants won’t open them. Mehmet challenges his brother by standing right in front of the crossbow’s bolt. Mehmet accuses him of trying to keep him locked up. Shahin doesn’t want him to go out and see Fahriye. Mehmet is determined to go even though his brother says he’ll never get what he wants. Reluctantly, Mehmet gives his word. The brothers embrace. Two other brothers are together here—Sultan Ahmet and Shehzade Mustafa. The sultan is building a wooden model of a galley. Mustafa says he wants to build one, too. Ahmet gives him a sheet of paper and says he has to begin with boats made of paper. Fahriye Sultan is out walking and runs into Dervish. She has been upset because days have gone by since she last heard from her lover. She nods to Dervish coolly, and excuses herself quickly. Dervish looks after her speculatively. Handan is relieved when Dervish enters. He tells her Safiye sultan wants to marry him off to Fahriye. Dervish clearly did not refuse, which alarms Handan. They go back and forth for a moment over the fact that he has never betrayed her. And never would. He points out that the sultan would have to approve the marriage. Handan wants the subject closed as soon as possible, but it is pretty clear that Dervish is thinking about the advantages of such a marriage. Mustafa mentions how he wants to have lots of galleys when he’s padishah, which causes Ahmet to look troubled. Dervish arrives and says he has a matter to discuss with the sultan. Hassan and Davut are facing off against each other with wooden practice swords. Hassan says Davut is responsible for Iskender’s death. Davut knocks him down. Zulfikar says that no one but Iskender is to blame for what happened to him. Just then, Iskender arrives back at the camp, delighting Hassan, who runs to him. Instead of chopping off Iskender’s head, Ahmet uses the sword to cut the rope binding his hands. “Stand up. We’re going to spar.” Ahmet hands him the sword. Iskender takes the sword, but still looks uncertain. Ahmet puts a hand on his shoulder and tells him to show him all his strength because he, as sultan, needs this kind of hard practice. They begin to spar. It appears that Ahmet had made a loyal friend with his actions here (I hope so, anyway!). Ahmet is seated on his throne and Safiye is before him. She is complaining about his actions of depriving her, his own grandmother, of her servants and associates. Safiye Sultan dips a small curtsey and exits. She is doing another spell. Her servant enters and asks what she’s doing. She shows her the candles, each of them named with her enemies names. Ahmet, Safiye, Handan, the Giray brothers. They’re going to burn and melt. “That’s mine. I lost myself. My pride blinded me and I forgot my own son’s death. Handan arrives in the rooms and reports that Safiye has launched another scheme. She gives Halime the news about the proposed marriage. Halime offers her a drink. Handan takes it, but doesn’t drink. Halime takes the glass back from Handan and drinks it herself. “We must trust each other,” she tells Handan pointedly. She says that if Dervish accepts the marriage, it will make him more powerful. He will be on a path for the Divan. Of course, there are dangers with the temptations of wealth and power (she puts the thought of these dangers into Handan’s head) but surely Dervish will know how to avoid these mistakes…. It looks as if Handan has her doubts about this. (Halime is a pro at subtly putting ideas into other people’s heads). Nasia is clumsily trying to serve Safiye with a drink. Safiye is impatient with the girl. Cennet comes in and Safiye chides her for leaving her alone with this child. Cennet sends her to her own room while she attends to Safiye’s headache. Nasia drops something and, while going to pick it up, feels something odd underneath the carpet. She investigates and finds her own letters to her parents that she had given to Cennet to send. Cennet grabs her and threatens to put her face into hot water and ruin her looks. Cennet is unimpressed. She tells Nasia to smarten up—how could she have sent the letters, anyway? Then she tells her to go to hell. Nasia clutches the letters to her chest and walks slowly down the corridors towards the Has Oda. She demands that the guards let her in to see Ahmet. They tell her it’s forbidden, a word she is in no mood to hear right now. She is about to try to force her way in when Dudu hatun comes parading down the golden road with the cariye who has been prepared for the sultan tonight. The two girls glare at each other and then Nasia pushes past everyone into the sultan’s chamber. 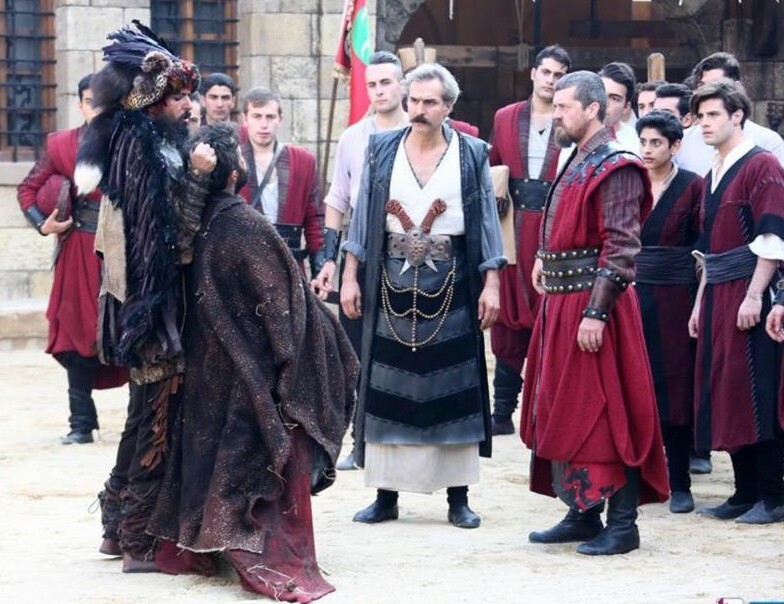 Dudu hatun chases her in and apologizes to the sultan, saying she doesn’t know how this happened. Ahmet tells her it’s okay; Dudu can withdraw. He gets up and goes over to Nasia. He calls her his jasmine flower and kisses her. Weeping, she goes to the door, but then she changes her mind and runs out on the balcony. She climbs onto the parapet. She hesitates, but finally she flings the letters over the railing, and we hear her speaking to her parents, telling them not to forget her and not to give up hope. He retorts that one day she’ll thank him for bringing her here. Reyhan aga, her other enemy, orders her back to her room. Meanwhile, Dervish comes out of what I always think of as Ibrahim’s room. He and Nasuh have another sharp encounter. Nasuh is setting out in the morning for his new job in the east and wants to see the sultan. Dervish says it’s not convenient. Nasuh points out that he’s getting above himself with the promise of more power, but that the damat role often leads to a stretched neck. Dervish tells Ahmet the news that Kasim pasha, who was appointed to go to Baghdad, didn’t go and stayed where he was in Bursa. Plus, he raised taxes for his own benefit, hurting the people. Shahin gives him a message to send to the Kalenders. After he leaves, Halime’s servant asks her whether Dervish will agree to the marriage or not. “I don’t know.” She can’t quite figure Dervish out. She says there’s a fire burning in his eyes, but also a darkness. The servant says Fahriye sultan will probably be pleased with Dervish, since she’s always been married off to old men before. Two groups of sultanas and their retinues approach each other—Safiye sultan and her group, with Nasia included and Handan and her servants. They greet each other with the usual biting courtesy. Handan says that the dynasty is already well cared for. She then says she know Safiye is trying to use Dervish and of course she has brought this little snake into the palace. “I’m not a snake,” Nasia interrupts. Haji aga tells Nasia to be quiet. Safiye tells Handan she’s going to lose this struggle. Bulbul and Haji aga have a small conflict, where Bulbul tells him he should be a human first before he can really claim to be a haji. Halime visits Fahriye and pretends to innocently break the news about the marriage. As Nasia enters the room, she’s confronted by Shayese, the cariye who was denied entrance to the sultan’s room the previous night. Nasia tries to avoid her, but the girl is angry. She basically ambushes Nasia and accuses her of interfering with her halvet. When Dudu hatun shows up, this cariye says that Anastasia prevented her from going into the Sultan. Dudu reminds her that these matters are up to the Sultan, not to her. A gift box has arrived from the Sultan along with an order that Anastasia from now on will live up on the higher floor where the gozde apartments are located. This seems to confirm to everyone in the harem that Anastasia is now officially the sultan’s bedmate. Cennet mocks her and says now that they’ll be living together, Mahfiruz can examine her herself. She orders them not to fight. Mahfiruz: “I don’t get it. I don’t see what the sultan sees in you. Did you work a spell? The rejected girl, Shayese , comes to the room to continue to air her grievance, and Mahfiruz eggs her on. “You said you didn’t even want him!” She complains, referring to last week’s altercation between Mahfiruz and Nasia. Shayese attacks Anastasia, grabbing a pair of scissors. Mahfiruz leaves the room, but holds the door closed from the outside so Nasia can’t escape. Nasia screams for help, but no one comes to her aid. Ahmet has some of his new Divan members, including the new grand mufti, whom we see after the Divan meeting, talking to the Giray brothers. The new mufti mentions that their fears about the young sultan were wrong—Ahmet has proven himself intelligent and wise. 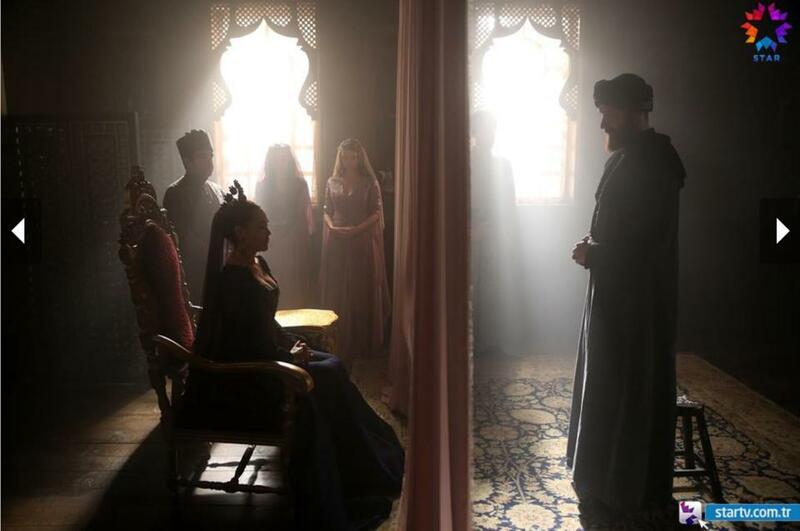 Reyhan aga tells them that Dervish is getting married to Fahriye. Mehmet Giray is dumbstruck at the news. Shayese gets caught wandering the hallway by Haji Mehmet and Dudu hatun, who realize something bad has happened. The girl is locked up in the dungeon. A prisoner is brought in by a scary-looking dude with a feather head-dress and wings. The prisoner is a Janissary deserter who fled from the battlefield. Meanwhile three honey-heads were delivered to the sultan from the Sinan pasha who is supposedly following the sultan’s orders and executing his justice with the Celati rebels. Back at the Janissary enclave, as the deserter is about to be executed for running from the field, which he has confessed. But he claims the sultan isn’t getting the truth. The Celats are coming—their rebellion isn’t being put down. The three heads weren’t leaders; they were just poor slaves who couldn’t even handle a sword. The sultan has been deceived by his pashas. The rebels are coming and anyone who values his life had better fear them. Despite his information, the cowardly deserter loses his head. Dervish meets up with Safiye Sultan in the gardens. She is being shaded by a huge, gorgeous parasol. Dervish tells her that the sultan has left the decision about the marriage up to him. He tells Safiye that it will be a great honor for him become a damat and that he accepts. But he is not sure that he will be considered a good choice by her. Safiye wonders if he is trying to put conditions on his acceptance? Because if so, she isn’t sure whether it means he is brave or foolish. When he claims to be more loyal and devoted to the sultan than ether foolish or brave, she says she hopes he gives the same devotion to her daughter. Golge is looking for Nasia. 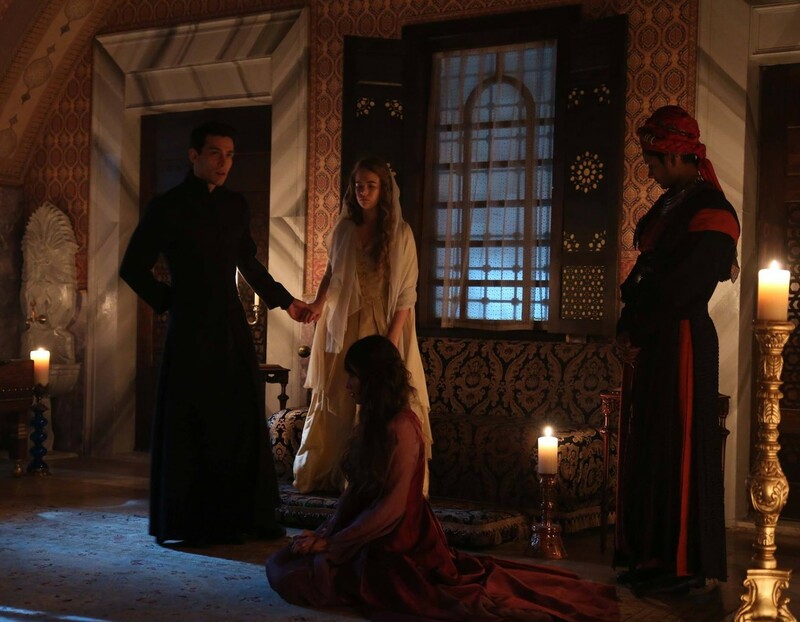 Mahfiruz tells her that Nasia was raised to the gozde floor, but as soon as she was elevated, she fell. Golge finds Nasia weeping on the floor, her face bloody with wounds and her hair partially chopped off. Dudu tells Handan what has happened to Anastasia. 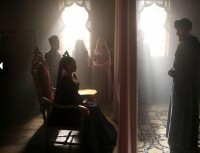 Dudu thinks the sultan should be notified, but Handan insists that he shouldn’t be bothered with such a trivial matter. Dudu points out that Nasia is important to Ahmet. And besides, they can’t exactly hide it—anyone looking at Nasia will know she was attacked. But Handan really doesn’t want to be bothered. Handan meets Dervish in the harem corridor. He tells her he has accepted the marriage. She is furious. “It is the right thing to do,” he says. camp. Dervish takes it to Ahmet. It’s about the deserter and his final words. That night, Ahmet goes to talk to Zulfikar at the Janissary camp. He sees the head of the dead man. 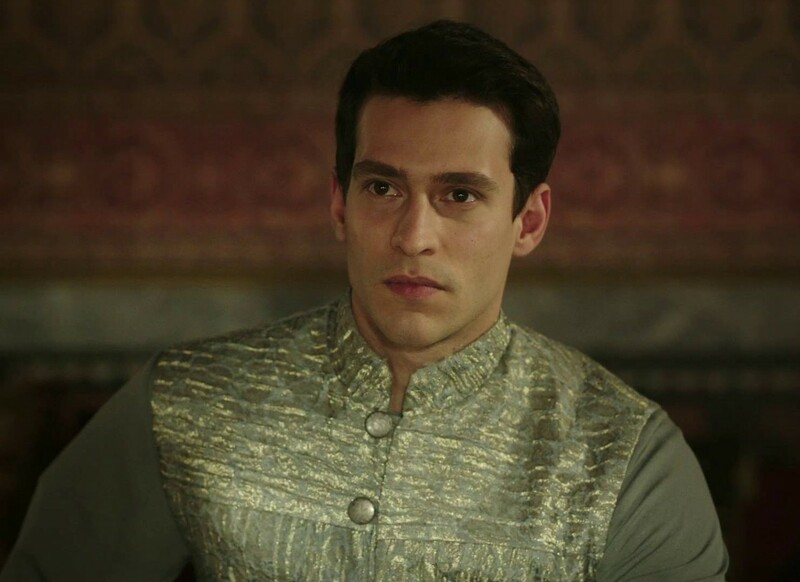 Ahmet is upset at all the betrayals he is finding out about. There are traitors all around him. In the palace. Perhaps people who look him in the eye every day. Safiye is talking up the benefits of the marriage to her daughter. Dervish is brave and smart with a bright future. She has no doubt he will make her happy. But Fahriye protests. She’s not happy. She’s already been forced to marry three times—one guy died on their wedding night, one disgraced himself and was divorced by her, and the last was killed right in front of her. After these experiences, this new marriage is supposed to make her happy? Safiye tells her to snap out of it. She mocks the idea of dynastic marriage having anything other than a purely practical purpose. Shahin is going somewhere for a few days and he pays his guards not to tell anyone at the palace. Mehmet is depressed after learning about the proposed marriage. Shahin uses this mischance to try to recruit him to his cause—stand up against the sultan and his family. Golge goes to Ahmet with news of what’s happened to Nasia. At first it seems that no one will allow her to see him, but the sultan is on his way back to his rooms and she is able to tell him. 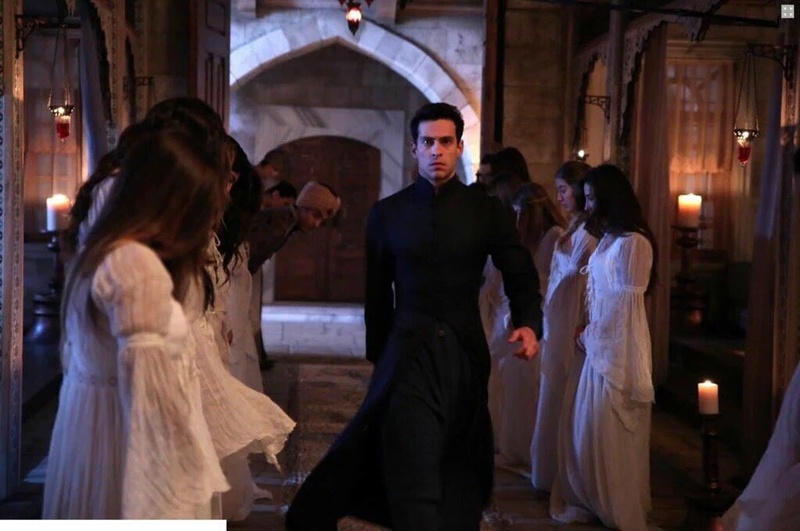 Angry, Ahmet marches down into harem and goes straight to Nasia’s new room. He touches her gently, but she keeps her face turned away. Ahmet looks at her face and kisses her and soothes her wounds. She leans against his shoulder. Golge goes to collect the prisoner and drags her, screaming, to the sultan. Shayese tries to pin some of the blame on Mahfiruz, who claims she is lying. Shayese begs for mercy. She says a devil took her over. Ahmet decides to leave the decision of what will happen to her up to Nasia. She can order her locked up, thrown out of the palace or killed immediately—the judgment is up to her. In the harem, Bulbul blames Cennet, saying Mahpeyker was entrusted to her. Cennet complains that she has too much work, trying to take care of Safiye sultan as well as this child. Everyone is surprised when Shayese is returned unharmed to the harem. Nasia says that her dad told her that your fate is entwined with those of others. No matter what you do, or where you go, you can’t run away from your fate. Ahmet says our fates are entwined. But Nasia still isn’t convinced about that. Head held high, Nasia returns to the harem and marches thru like a queen, in spite of her ragged hair and the cuts on her face. She finds Golge in her room, waiting for her. She has decided to help her escape. He calls in the guards as soon as Reyhan starts making excuses. Reyhan falls to his knees. 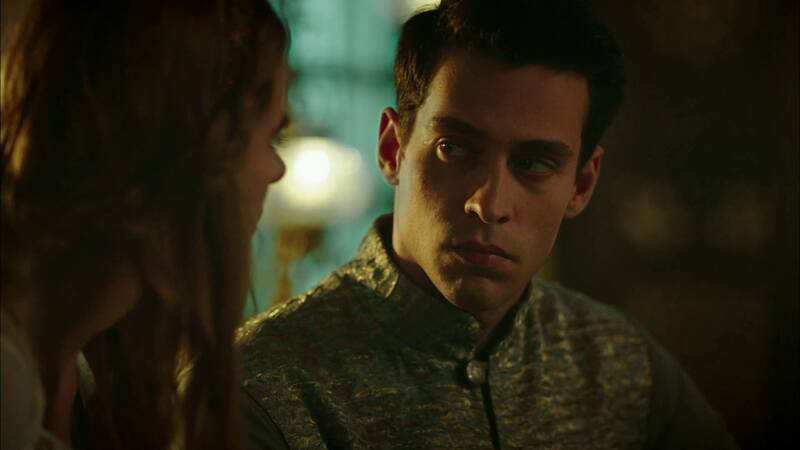 All the eunuchs start blaming each other, and Reyhan claims that he wanted to let the Sultan know about this but Handan said no, not to bother you. 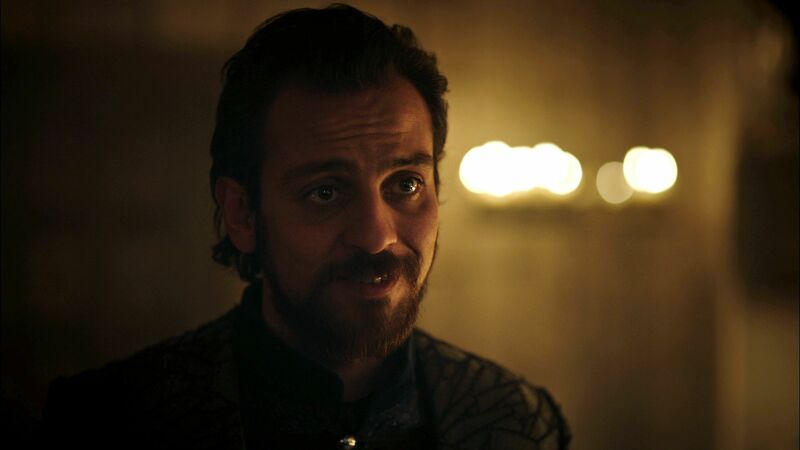 “Bring them,” Ahmet orders as he sets off for his mother’s chambers. Handan says she was going to tell him in a more convenient time. When he leaves, still furious, Haji aga tells Handan that it’s all Reyhan’s fault. Reyhan protests that he could not lie to the sultan; he barely saved his own life. Handan is sick of listening to them. She orders them out. She tells him she doesn’t want to talk about it. She doesn’t care to discuss which palace they’ll live in or when the wedding celebration is going to be, or anything else. She walks out on him, taking Mustafa with her. Back in her room, Mustafa is upset that his paper boats got left in the water. Fahriye receives a love letter from Mehmet. (Looks like he broke his promise to his brother). He wants a meeting. Fahriye’s servant urges her not to go. But Fahriye thinks it will be the last time, so she is determined to go. Halime’s daughter is asking when she will be getting married when the shehzade rushes in. He has made a new paper boat out of Mehmet Giray’s letter. He floats it in his mother’s water basin, annoying his sister. After he leaves, Halime sees that there is writing on the folded paper boat. She examines it and is surprised—and delighted—at the evidence that has just fallen into her hands. She tells her servant that one of her enemies, Mehmet Giray, is going down. She has discovered Fahriye’s secret love. Golge leads her through the passage that leads to the secret garden and down a series of steps and passages until they get to a wall and a locked door. Golge indicates that it is locked from the outside. Nasia realizes they will need outside help if they’re ever going to get through this door. 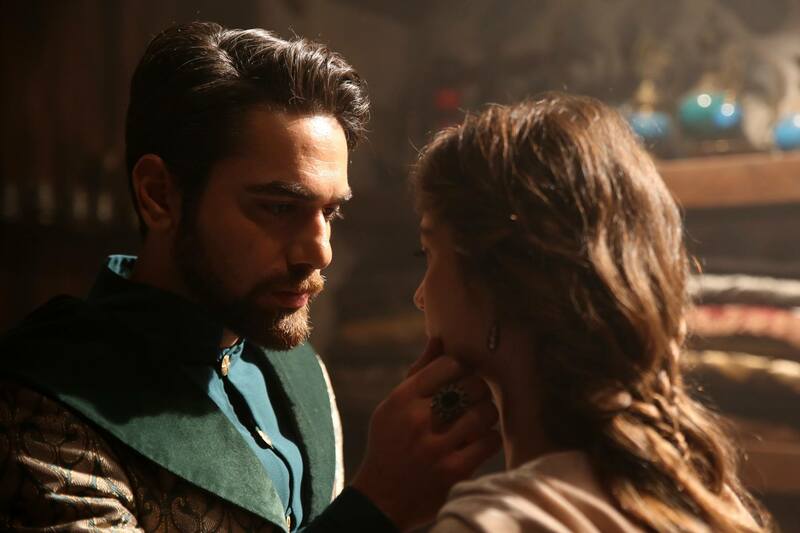 Zulfikar tells Iskender that he has been summoned again to the palace. He says this means that he will probably be getting close to the Sultan, but he reminds him that this is not for his own glory but so that he can continue to protect the brotherhood of the Janissaries. Kasim pasha has returned. The viziers and pashas wonder why they have been summoned. Sultan Ahmet shows up and declares Kasim a traitor. Surprised, the man protests that he was told he was to return and take up his old position. Surely the sultan is not going to break his promise. Ahmet says you broke your promises, now I’m breaking mine. He pronounces his judgment—death. The execution is carried out immediately and Ahmet briskly makes new appointments, demoting the incompetent pashas, especially the guy who sent the three heads, and promoting the good ones. He then announces that Dervish is now the head of the navy. Ahmet is flexing his muscles of power. Handan asks how they can prevent it at this point. Dervish enters his room, finds and reads the letter. Shahin is riding on a country road. An old man steps his horse and begs for water. Shahin gives some to him, but the man attacks, pulling him off his horse. Shahin defends himself, then realizes he is being ambushed by the Celatis he was going to meet. They knock him unconscious. He wakes up in their camp. “I told you I see you again,” says the guy Shahin last saw in the harbor when he prevented the rebels from helping Halime and her children escape. Shahin is arrogant as usual, which amuses the rebels. He asked to be taken to their leader. But the old man who had asked for water tells him they don’t have a leader, they’re all equals here. But if Shahin wants to, he’s welcome to bow down to him. Fahriye goes to meet Mehmet in their usual location in the marketplace. Right on cue, Dervish bursts in. Halime lights the candle of one of her enemies. “Mehmet Giray” is written on its side. He will be the first to burn. The rebels are joking with the Shahin Giray, but they are the only ones laughing. He suggests they join up and march on the capital. They chuckle. They can’t fight the sultan’s army, they tell him. But Shahin claims to have gathered some soldiers and some leaders who will support the rebellion. As for the sultan himself, Shahin says he’ll take care of him. Everyone except Shahin bursts into laughter. Anastasia is feeling sorry for herself. She looks at herself in a mirror, seeng her wounded face and her chopped-off hair. Cennet brings her a bundle. When she unwraps it, she finds a huge pile of jasmine flowers, which makes her smile through her tears. Nasia hurries to the secret garden to thank Ahmet for his gift of flowers. She finds Alex there. He has again been summoned by the sultan to spar. They’re both shocked as they recognize each other. We see Ahmet striding down the halls of the harem, presumably headed for his meeting with Iskender. Nasia: “You’re seeing me now. Here I am. I’m alive. Soon I’m going to run away.” She sees that he is wearing her ribbon around his wrist. (He must have gotten it back from Davut). Just then Ahmet arrives. He stares at the two of them and they look guiltily back at him. My Turkish is not perfect. All errors are my own. Thank you very much for taking the time to write these translations. I’m enjoying the series so far, and yours is the best summaries I have read. I appreciate the level of detail you included.